Whether you are a serious competitive golfer, a casual player, or just picking up the game, chances are you’ve seen some big hitters out there on the links with a rangefinder and wondered if you should part with the cash to get your hands on one of these cool devices. After all, they can be kind of pricey and there are free programs on your smart phone to track distance, right? Well, your phone uses kind of slow GPS, which can be a real battery hog, and it’s not as accurate as a laser rangefinder. With a rangefinder that fits in your pocket, you can quickly find a distance to a tree, a lake, the pro shop, or whatever, without the lag from GPS! It is particularly useful when you can’t see a marker over a hill or other landscape feature, or when the background of a marker is a bank of trees. Avid golfers like to see the entire course laid out on a GPS device, but agree that having a quality rangefinder is a better tradeoff for pinpoint accuracy on your target (or hazard – some of us just need to know what not to hit). So dive in here and see what we found for you. Happy Golfing! Pros everywhere love Bushnell sporting gear, and it’s really no wonder why they do. 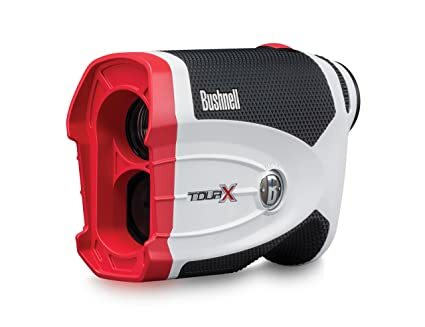 Bushnell has been the frontrunner in sports vison gear for years, and they don’t disappoint with the Tour X Rangefinder, a laser guided unit that is sure to up your game on the course. Do you want to know how far you need to hit that ball to make it to the flag? Do you want to measure how far you hit a ball after you swing? The Tour X gauges your distance from where you are to your target, helping you decide how hard or soft you need to swing, and which club is best for the play. It will also help you detect how close your ball will land in relation to water hazard or sand trap, and assist in keeping you out of the woods. Are you hitting up or down hill? The Tour X has slope variation technology to help you accurately account for additional or less yardage to compensate for slopes. After a while, you will start to visualize distance on your own, all thanks to your rangefinder. Tournament rules are very specific when it comes to using distance guides and won’t allow slope variation technology to be used in play, so you want to be sure you are within the guidelines for using your rangefinder. Of course the geniuses at Bushnell thought of this, and the Bushnell Tour X is loaded with Exchange technology. You can simply engage the red faceplate to use slope variation when you are practicing (to guide you in correction for hills), and engage the black faceplate to comply with regulations in a tournament. Officials can clearly see that you are compliant. Of course, when you are far enough from your target to warrant the use of laser technology to find it, you want to be sure you’re aiming for the right spot. Enter PinSeeker with JOLT Technology. The Tour X offers this technology to provide assurance that you have located the marker by vibrating when it locks onto the target. When accuracy counts (and isn’t that the only thing that matters in golf? ), you need Bushnell’s 2nd Generation ESP (Extreme Speed Precision). Not only will your yardage be more accurate, the feedback is faster than ever, so you’re not standing around waiting for your GPS to update. That’s important when there are others waiting to play. Exactly how far can you be from your target? With the Bushnell model, you can use the 6x magnification to accurately measure ranges (to +/-0.5 yards) between 5 and 1,300 yards. Now that’s what we’re talking about. Every player has a different preference for screen brightness, and we all know what the bright sun can do to a digital display. The Tour X offers Dual Display Technology, allowing you to adjust from a bright red display to a clean black display while keeping images and displayed information clear and colorful. It’s all about the options, my friend. The Tour X is the elite rangefinder model, and Bushnell stands behind their product with a two year warranty. A carry case is included and the unit runs on two lithium photo batteries. No need to carry a charger around, just keep a couple of spare batteries in your case and you’ll be good to go. If there was anything users dislike about the Bushnell, it seems to be mostly about the physical traits and not the technology. Some users thought it would be helpful to have a small pouch or separate pocket to hold the faceplates as they can fall out when removing the rangefinder from the carry case. Others were not impressed with the white and red unit, preferring a more subdued look. But, we think it’s nice to have something that stands out from the crowd a little, especially when you have the best technology on the course. With a list price of a little over $680.00, we can see why players might be hesitant to make the investment. We found it on sale consistently for about $425, bringing it into range with competitors. Overall, the price tag is worth the features you get and the improvement you will see in your game. Users particularly like that this rangefinder can pick out the flag, a sand trap, trees, water hazards, and the ball. They also appreciate being able to gauge the range of their shot to aid in selecting a club for their next swing, something that you just had to guess before. Users mention the ease of use, the joy of using the vertical slope feature to improve judgement of the distance (illegal during tournament play but awesome for practice as slope can change your actual range 5-7 yards up or downhill), and the accuracy of the range displayed. There’s no guesswork in this technology packed rangefinder, so you can be confident with the readout that you receive. You know that saying, shoot for the moon, for even if you miss, you’ll land among the stars? Yeah, we say get the Bushnell Tour X Rangefinder and shoot for the flag. There won’t be any landing among the trees, friend. The TecTecTec VPRO500 Golf Rangefinder is a lightweight model that does double duty for your convenience on the course. 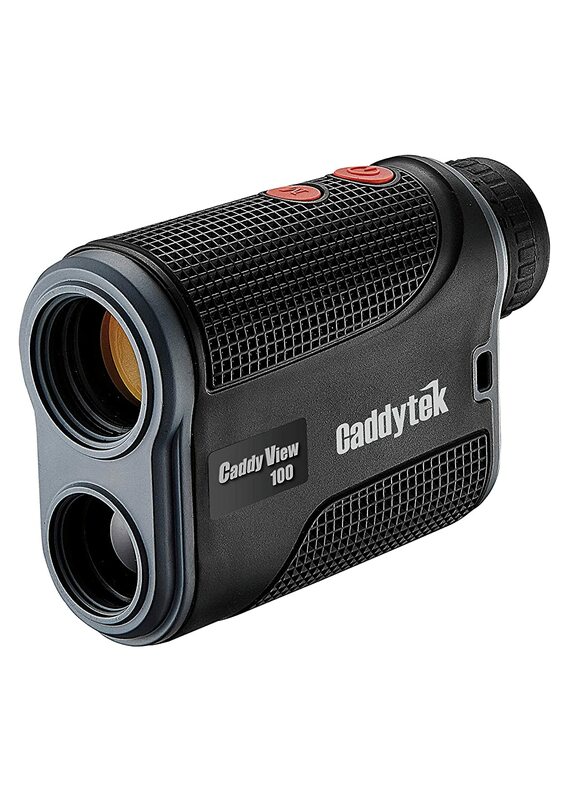 Not only can you use it to determine range on the course, you can leave your binoculars at home because this handy unit allows you to switch into view mode as a high quality monocular, great for spotting your ball or reading the menu on the snack shack. The VPRO500 provides crisp, clear images in bright sun or low light, with through-the-lens digital information display. You will love the super easy one button control and convenient lens adjustment for focus – no fiddling around with multiple buttons – just aim it and go. 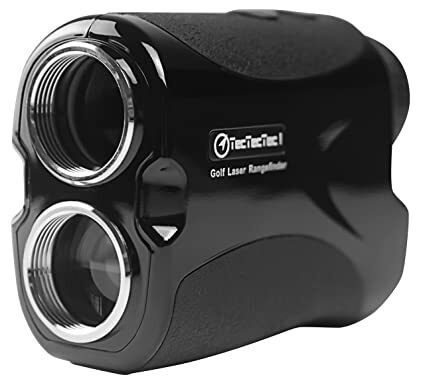 Totally tournament legal, the TecTecTec rangefinder stands up to its pricier competition with 6x magnification and excellent clarity. Try all three settings – First Target Priority (quickly sifts through background and scenery to find the flag), Distance Target Priority (tells you how far you are to the background and scenery) or Scan Mode (measures several points at once). It can pick out the edges of the sandpit for incredible accuracy on those tricky holes. The VPRO500 houses Pinsensor technology to pick out the flag without flaw – it can differentiate between overlapping objects and give you accuracy within 1 yard. Continuous scan technology checks out 540 yards of green for you with nearly immediate readings, which will please your buddies who are waiting for their turn. Through the lens display means you can see the reading as soon as the unit does – it’s right there in your sightline with clear, multi- layer images and a battery indicator. Speaking of batteries, this model uses replaceable CR2 lithium batteries for long life without needing an outlet for charging, and the first battery is on the house. Keep some extra on hand, though users report a pretty long battery life of at lease several months. The water resistant body of the VPRO500 means you don’t have to sacrifice your technology in humidity or light rain, and no big deal if you drop it on wet grass, though it’s probably toast if it ends up in the lake. The kit includes a convenient carry strap, so you should be able to keep it close. The sleek black body and included black case blend right in to your gear, but that’s one drawback for some users who said they’d prefer something more visible so they didn’t forget it. If there are any other issues with this model, we can’t find them. The VPRO500 is comfortable in your hand and small enough for your pocket. The company, TecTecTec, is serious about customer service. Not only will they contact you to be sure you are completely satisfied with your purchase of their rangefinder, they will give you all of your money back if, in 60 days, you’re not happy with it. They also give a one year warranty, so if you are totally satisfied and keep it, but something goes wrong over the next year, TecTecTec has your back. Oh, and did we mention they ship it to you free? Customer service is coming back. Overall, golfers who have used the VPRO in real life report satisfaction and ease of use, plus impeccable customer service and follow-up, and they enjoy the small price tag of about $150.00. We think this is an excellent price point for a feature packed, reliable rangefinder. 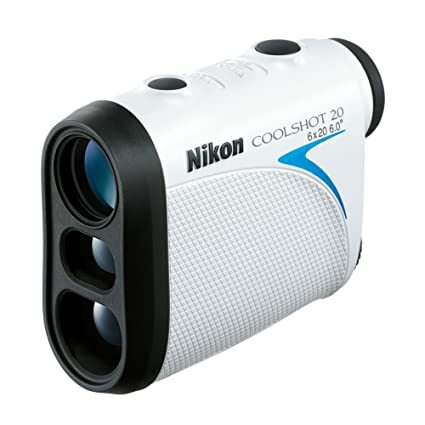 If Nikon is synonymous with lens technology (think incredible DSLR cameras with ridiculously fast shutter speeds and clarity), then it stands to reason the Nikon CoolShot 20 Golf Laser Rangefinder might be pretty darned amazing. First of all, can we just say that it looks really cool and sporty? It’s almost like it wants to play golf, too. The bright white case with blue accents won’t easily get lost in your bag or mixed up with another in the pro shop, and it is totally rain proof for when you just can’t stop playing for anything. It includes a soft sided case, carry strap, and replaceable lithium photo battery, which won’t need to be replaced for several months. We were a little surprised with a range of only 550 yards in the Nikon model, but the clarity and accuracy in those yards is incredible. It is a case of quality over quantity, and can you really drive a ball more than 500 yards? You can switch the display from displaying yards to displaying meters if you prefer; Nikon makes it easy. First Target Priority mode sights the flag stick, picking it out from a busy background, bright sky, or reflective lake, and locks onto it immediately for quick target identification. The 8 second continuous scan feature allows instant measurement of multiple targets, which we love because you can quickly scan all of your options and get swinging. Of course, as we suspected, the Nikon optics are top notch and turn your rangefinder into a 6x magnification monocular. The top- of- the- line lens technology allows a clear view of not only your view straight on, but up, down, and side to side. Go ahead; take in the breathtaking view of the course at dawn. We’ll vouch for you that you’re just checking out the stats. There are a couple of buttons on the unit; one is a power button and also operates as the continuous scan button. The mode button allows you to toggle through the settings, such as yards vs meters, target lock, or First Priority Target mode (locks onto the closest object against a busy background for sighting the flag stick against the trees or finding your wife watching on the sidelines). You can adjust the focus with a dial just below the viewfinder. The Nikon model is very easy to use and comes with instructions, but you might not need them unless you’ve never used a laser rangefinder. Even then, it will only take two seconds to figure it all out. The Nikon CoolShot 20 is tiny. It is so small that you can literally wrap your hand around it, which makes it very comfortable for women and teens. It is totally tournament legal, discreet, and lightweight. This little golf buddy will range just about anything – a tree, golf cart, water hazard, sand pit, and the edges of bunkers. You don’t have to worry about picking out the flag stick from a background of trees – the Coolshot makes it easy, and you don’t have to be perfectly still to obtain a good reading. Not only can the unit find it instantly, you can see it clearly through the Nikon lens. Do you wear glasses? Don’t even worry about it, because Nikon thought of that! With long eye relief design, you can see clearly and easily without removing your glasses. Last, but not least, the CoolShot 20 has an auto shut off feature to save your battery when you’re not using it. With a price tag of just under $200 on the CoolShot 20, you get fantastic clarity with the technology you would expect from Nikon, and they stand behind their name with a two year warranty. Overall, we are impressed with this compact, technological wonder from Nikon and think you will be, too. The CaddyTek Golf Laser Rangefinder with Flagseeking Technology is truly impressive for such an inexpensive model, with accuracy to one yard. Its retro styling is pleasing to the eye and fits in your hand easily with a slightly larger body size. It is not by any means tiny, but not cumbersome, either. The CaddyTek is compact enough for carrying in your pocket, and as sturdy as can be. It is fully waterproof, so go ahead and play in the rain. As leaders in the golf caddy business, these guys know golf. They’ve taken feedback directly from their caddy customers and translated it into user-friendly features to enter the playing field of rangefinders, and we think it’s great. Just like the big boys, the CaddyTek has 6x magnification for excellent viewfinding. It has a range of 5-1000 yards, though the flag seeking technology, which easily picks out the flag stick from a busy background such as trees, is limited to 300 yards. You can use the continuous scan mode to really get a feel for your next move and mark multiple distances. Just check it out to find distances to treelines, bunkers, water hazards, and the balls that have already landed up ahead of you. The LCD display marks your target and shows distance. You’ll need to pick up some CR2 photo batteries to have on hand when this arrives, because they are not included, and neither is a case. The tournament legal CaddyTek requires a fairly steady hand at somewhat closer range to get an accurate reading on the flag, and the clarity is not what you would find in a much more expensive model, but it works as intended and can really help you get ahead in your game, especially for a beginner. We wouldn’t recommend this model to replace your binoculars, though, as the image and distance is better suited just for sighting your marker. If you just need help sighting the flag or measuring distance to hazards, the CaddyTek will do the job just fine. If it doesn’t live up to your expectations, you can return it for a refund within 30 days. For under $150, the CaddyTek Golf Laser Range Finder is perfect for new golfers, or those who play recreationally and just want to get a better feel for the game. It won’t break the bank, it looks great, and it does its job well. It is called a rangefinder, after all, so be sure you are choosing a tool that has an excellent range to fit your playing ability. If you are a beginner and can’t drive that ball more than a hundred yards or so, then you won’t need to invest in a tool that measures much farther than you can send the ball. Now, if you are a professional or competitive golfer and you can knock the ball across the course with your eyes closed, you will obviously need a device that has a much longer range. Let’s face it, if you are spending money on a companion device with the purpose of improving your game, your measurements must be accurate. Look at the accuracy claim on each rangefinder you are considering and look for the best your money can buy. Measurements are to the yard (or meter), and range from .01 to 5 meters accurate. You should only invest in what you need. If you just need to know how far you are from the flag, then you don’t need many features. However, if you want to know your distance to many different objects, if you frequently play on difficult courses with hidden obstacles, or if you typically bring along binoculars and want to eliminate the need for a second device, you will naturally want more features. It goes without saying that seeing is believing. Your device might tell you that you are 305 yards from sand trap, buy you will probably want to see it with your own eyes. Some rangefinders have much better clarity than others, and it is well worth it to spend an extra few dollars to get a crisp, clear picture. Also consider how easy it is to read the display in bright sun, overcast glare, and evening or night time golfing. After reviewing lots of laser rangefinders for you, we can assure you they all have one basic function – to measure distance between you and the object you choose. This can be invaluable to beginner golfers who have no idea how far they really have to hit that ball, and an excellent tool for fine tuning the game of a seasoned golfer. Some models have advanced features, such as continuous scan with the ability to measure more than one point in the same screen, or special pinpoint accuracy technology. Some devices can take the place of the binoculars you usually carry with you, and some may just be very basic. Whether you want to up your game and lower your handicap, a rangefinder can make a big difference by giving you the courage to hit that ball just a little harder to reduce the number of strokes you need to take, or to understand you may be closer than you think so you can back off a bit and avoid overshooting. Of course, if you just want to give an awesome golf gift, you’ll be the recipient’s best friend for years and years to come. Rangefinders are a wonderful tool for golfers. It is hard to imagine a world where we didn’t use technology to play golf, but since we do now, you owe it to your game to try it out. Go ahead, up your game and lower your handicap. Ask your golf friends about their rangefinder preferences, and consider all of the points we’ve laid out for you. Having a laser rangefinder for your golfing needs is both fun and functional. Choose one of the rangefinders reviewed here are you just can’t go wrong!